Best choices for the planet: big fish or little fish? Recently I interviewed Mike McDermid manager of the Vancouver Aquarium’s Ocean Wise program, about why we all need to be careful to choose sustainable fish and seafood. He had many valuable things to say on the topic but our discussion about whether we should eat big fish or little fish was particularly interesting. “Overfishing and habitat damage have led to massive species declines, even extinctions, and have caused dramatic shifts in ocean ecosystems. Within the past century, 90% of all large fish species are gone; we are now fishing the last 10%. The good news is that as consumers we can help to reverse these trends by choosing seafood that is harvested in a sustainable manner,” explained Mike. Which led me to ask him if that meant we should be eating sardines and anchovies and foregoing salmon and tuna? “I’m not sure if it is important – I included that statistic to illustrate where we are currently with respect to commercial fisheries and the dire need to start considering where our fish are coming from. There are sustainable fisheries for large fish species, making them a good option, but I wanted to illustrate that the oceans are not this “endless bounty” that we once considered them to be. Because my husband Martin Kouprie has long been a member of associations such as the Endangered Fish Alliance and now Ocean Wise, I’ve been trained to make my fish choices carefully. How about you? Do you choose fish based on the recipe you plan to make or choose the recipe based upon the fish that experts like the Vancouver Aquarium and Monterey Bay Aquarium deem most suitable? Tip: By the way, If you have an iphone, you might like to download this free Seafood Watch application that you can use at restaurants and grocery stores to make planet-friendly fish and seafood choices. As would be expected, when the economy tightens up, frugality becomes a big trend. Not only has the canned meat product Spam seen a huge sales spike since the mortgage crash in the US, but carrying your lunch has become more popular, too as the economies on both sides of the border have suffered. Even Ivanka Trump is joining the brown bag brigade. Recent research shows that 93% of people who take their lunch do so to save money while 68% make the choice for health and nutrition reasons. I fall into that second category; however, an added incentive for me is that the food I make myself is usually much more delicious than the stuff I can buy easily. This brown bag survey (conducted by market research group NPD) also found that the top three items in lunch boxes were reported to be sandwiches, frozen entrées and yogurt. Although I keep Green Giant Essentials in the freezer at work for emergency afternoon snacks, I would never even think of packing a frozen entrée for my lunch. But, then again, I don’t buy frozen entrées generally. My own lunch is most often veggies (cooked or a salad), often with tuna salad or hummus on top. 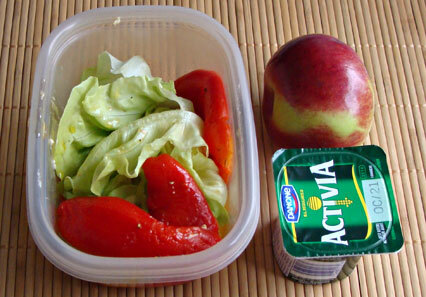 Some days it’s a simpler salad with a yogurt and an apple (like yesterday’s lunch pictured above). How often do you pack a lunch and what makes it into your lunch bag? Is your menu typical or do you pack a lunch bag full of fresh ideas?